I once heard that there are three fine cuisines of the world: French, Chinese and Moroccan. When my foodie family and I ventured to Morocco a few months ago, we put this theory to the test by enjoying as much traditional cuisine as humanly possible, to the point that pizza was such a treat upon our arrival in the US. 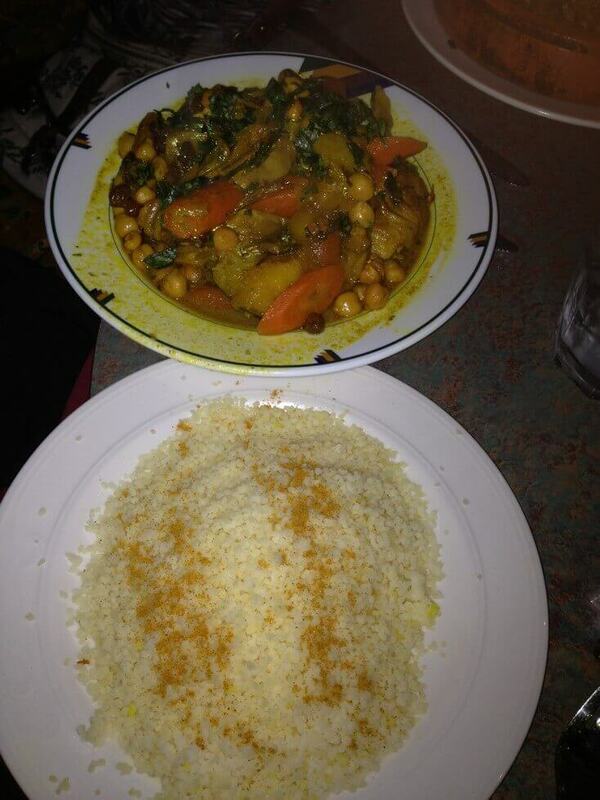 Yet four months later, my Moroccan overload had subsided, and I was craving some good couscous and tagine. Tangier‘s location makes it easily overlooked by the typical Boulder population. 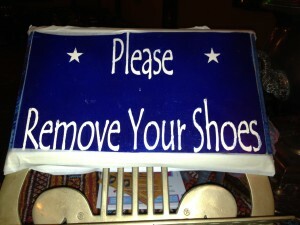 Not on Pearl St. or 28th St. Mall? Does it really exist?! But the restaurant’s unassuming location in a small shopping center easily holds it own, maintaining a true Moroccan feel while perhaps sacrificing popularity. One of my favorite things to do while trying a new ethnic restaurant is sampling a beer from that country. 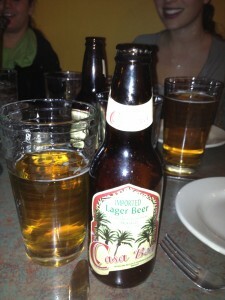 Though I had tried Casablanca beer before, it was just as exciting to enjoy it again. Although my usual dinner crew has learned to be adventurous after a year of eating with me, for most of them, it was their first time trying Moroccan food. I must admit, I kind of felt like a rockstar that I knew what most of the menu meant. 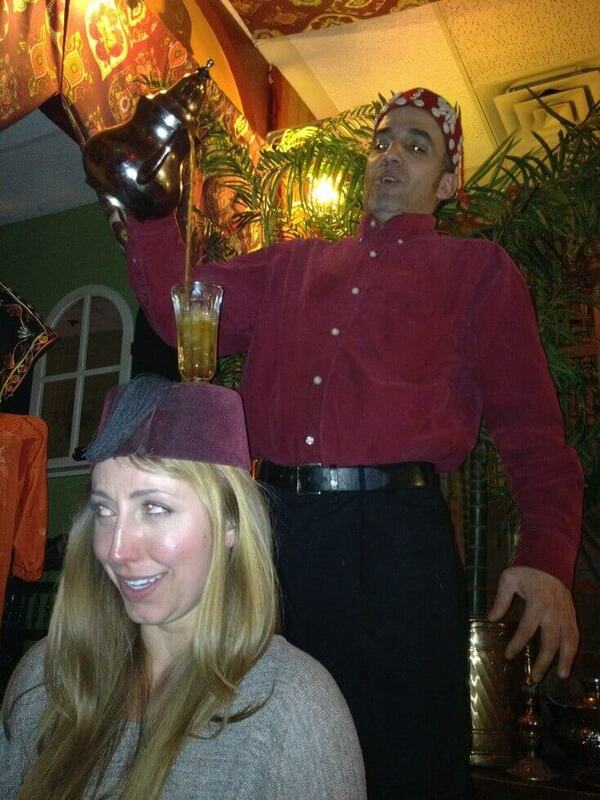 So they turned to me, and our gracious waiter from Casablanca, to lead them on their first Moroccan journey. So first up: eggplant salad (by no means a bowl of leafy greens, as my friends expected). Tangier made their spin on the Moroccan specialty with pureed eggplant, garlic, peppers, and plenty of spices. Its contrast from the rest of the food made it the perfect way to begin a feast. I managed to convince my crew to share a variety of dishes, including a chicken and vegetable couscous, a chicken tajine with lemon and olives, and a vegetarian couscous tafaya with chickpeas, raisins and caramelized onions. For the picky eater, the couscous with chicken and vegetables might be the way to go. 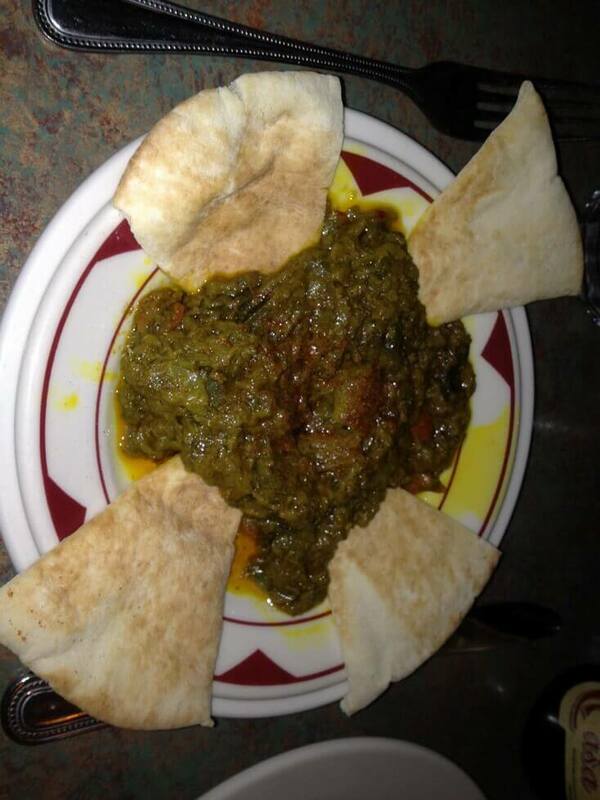 Or even for the adventurous, I’d order this again any day. The dish was rich in flavor, combining spices like cumin, curry and turmeric, and a satisfying balance of carbs, meat and veggies. The spices are what truly make Moroccan food unique and different from any other ethnic cuisine or homemade mixed vegetable medley. 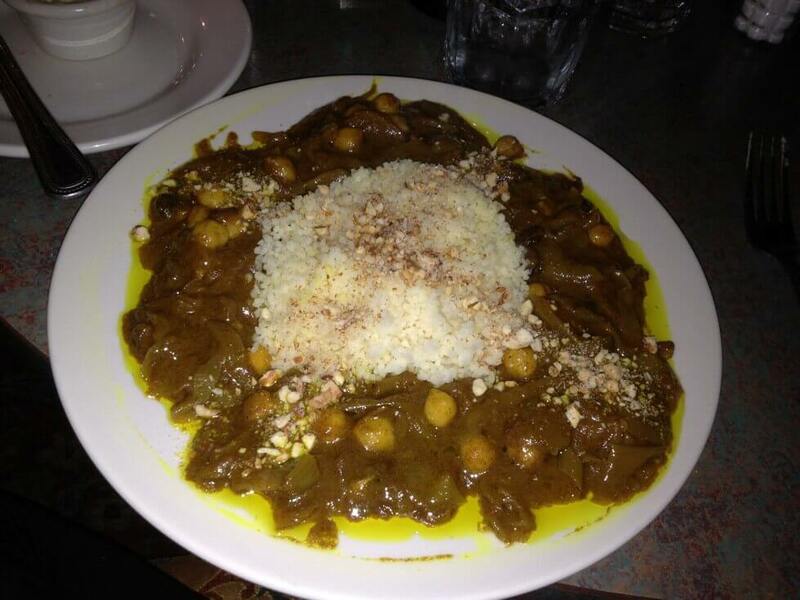 Tangier hits the nail on the head and impressively balances the right spices for a wonderful dish. 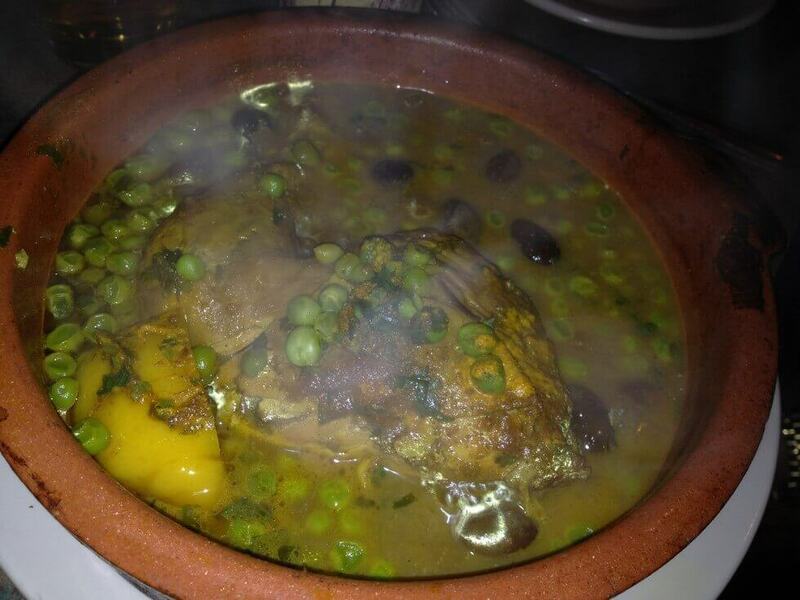 No trip to a Moroccan restaurant is complete without sampling a tajine, a meat and vegetable dish slow cooked in a covered clay pot. Tonight, I stuck to a Moroccan classic: chicken tajine with olives and preserved lemon, served with peas and potatoes. While in Morocco, we constantly encountered disappointingly dry chicken. I am delighted to report that Tangier’s was far from dry, in fact it was extremely juicy and full of flavor. But beware: the tajine was served PIPING hot! Finally, we also sampled a vegetarian couscous with chickpeas, raisins and caramelized onions. This dish was really different than anything else we ordered, and probably anything else on the menu, because of the different spices incorporated in the veggies. Instead of the standard cumin, curry and turmeric, this couscous was nutty and sweet. Perhaps it is an acquired taste, but I found it to be delicious and worth a try purely for its uniqueness. 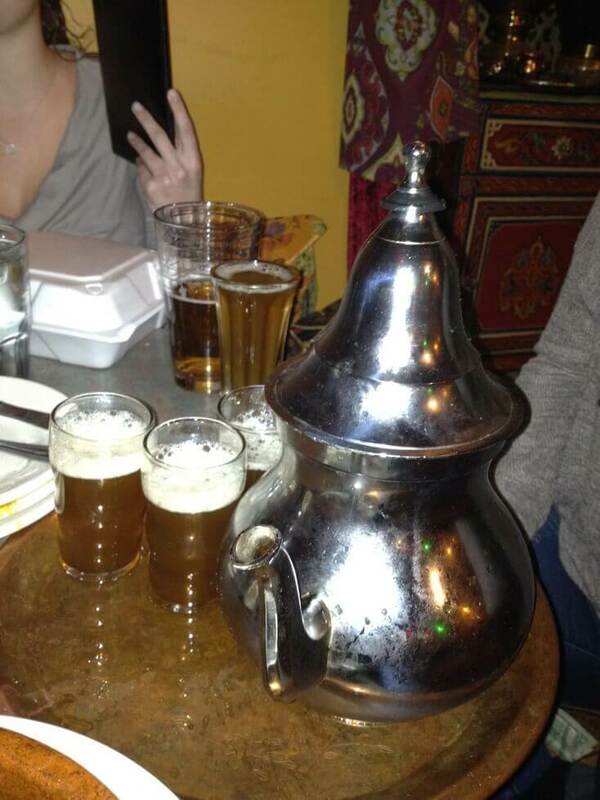 As our upbeat waiter brought us boxes for our heaping leftover food and cleared our plates, he asked my group if any of us wanted some traditional Moroccan tea. Stuffed to the brim and eager to move on with our Friday night, each of my friends immediately replied “no” in unison. I probably would have, too, if I didn’t know how delicious and amusing Moroccan tea can be. With some minor persuasion, they gave in (they are used to my persistent, FOMO restaurant habits by now!). Delicious because of the robust yet sweet mint flavors, and amusing to watch the tea waterfall into our cups (whether on the table or on our heads) from a teapot held far above our heads. When offered tea, say yes! 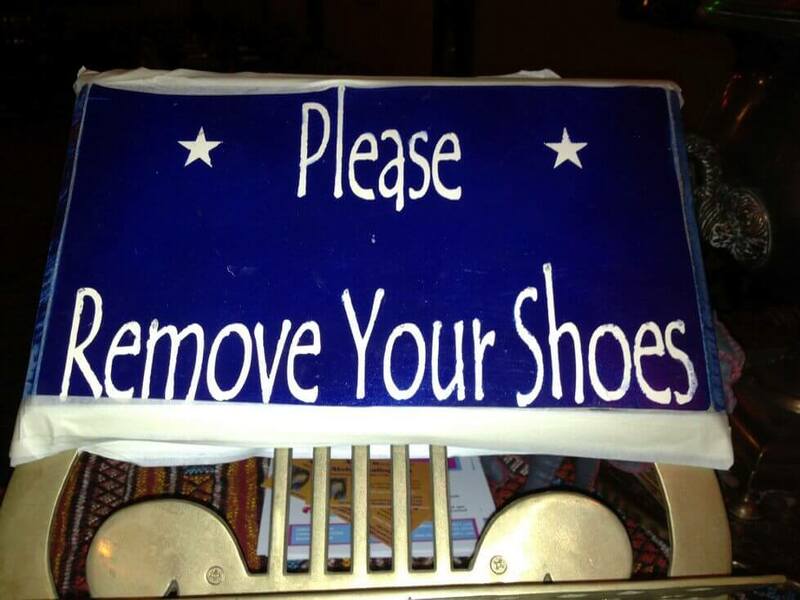 Although the thought of Moroccan food may seem a little intimidating to the picky eater, Tangier’s diverse menu, wonderful staff and different yet cozy atmosphere makes it a great place to begin. Come very hungry, and leave very happy, with leftovers. Ciao! Here is nice offering for you.